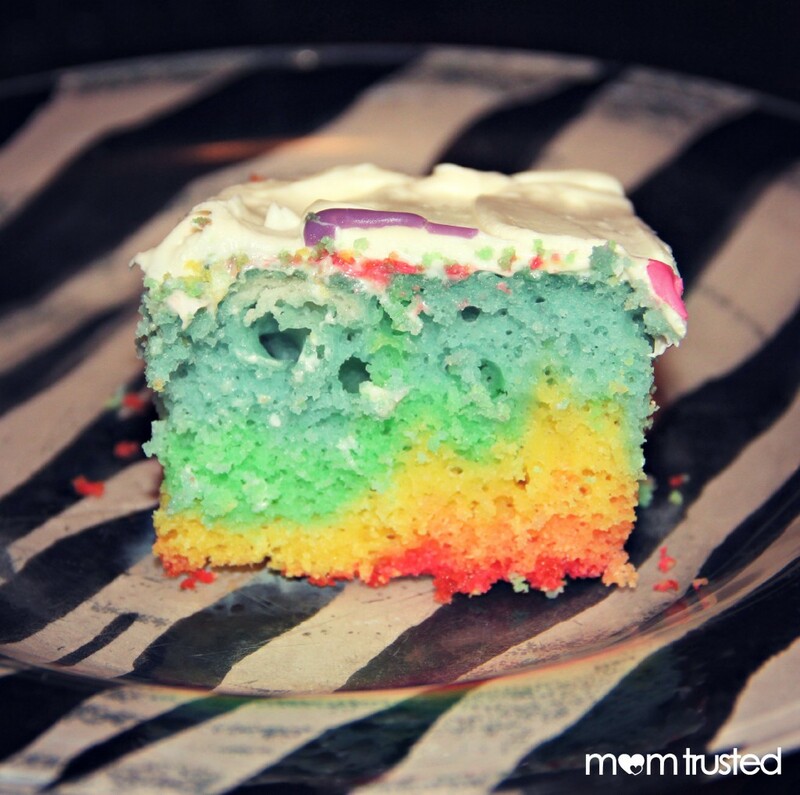 My daughter wanted a rainbow cake for her birthday…ok, maybe I planted the seed a little bit because I wanted to try this. It was fun to make and she totally LOVED the results. The process is super easy. Use your favorite white or yellow cake recipe or mix. Separate the batter into as many colors as you want. We separated it into 6 sections (red, orange, yellow, green, blue, purple). Then add food coloring to each section and mix it to the desired color. Once you have the colored batter ready to go, start pouring them in the greased cake pan in the order you want them. We started with red, then orange, then yellow, then green, then blue, then purple. Since we only used one box of mix, each color section didn’t have enough to fill the entire bottom of the pan…so we got this diagonal look instead of horizontal stripes. Next time I will probably use 2 boxes of mix instead of only one to take care of this problem. Also, the top of the cake looked really bizarre. We weren’t sure if it was going to turn out or not, but once you frost it and cut in it looks great.